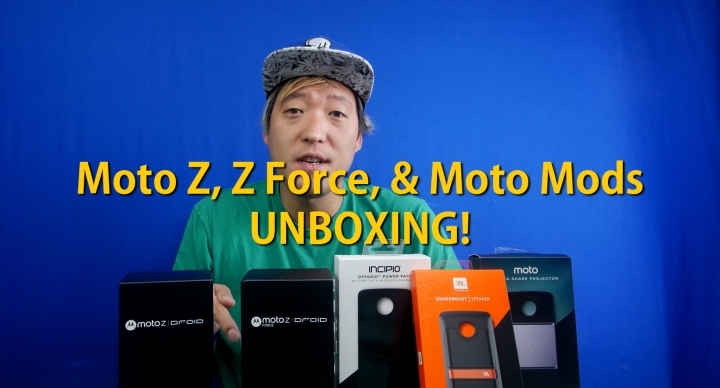 Moto Z, Z Force, Moto Mods Unboxing! Motorola has launched their new Moto Z, Moto Z Force, and Moto Mods about a month back and we have finally got our hands on it for an unboxing. Through our unboxing, we have found the Moto Z and Moto Z Force a force to be reckoned in the Android smartphone market. What’s most interesting about these smartphones isn’t its performance or camera rather its Moto Mods. Unlike LG G5, Moto Z and Z Force have ability to use modules easily by snapping them on the back of the phone with strong magnets. Motorola is also offering modules that makes sense, especially the Moto Insta-Share Projector module and JBL SoundBoost Speaker module. These modules make sense and Motorola is already working on a camera module that incorporates Hasselblad camera technology. I really dig the Moto Insta-Share Projector module as its support system allows you to project movies and alike in any angle including the ceiling. For people who enjoy movies at bedtime in their bedroom, this is going to be a great way to enjoy movies while laying down before falling asleep. Want to create instant 50-inch display wherever you go? No problem with the projector module. The JBL SoundBoost module is pretty insanely awesome. While most of us carry an extra bluetooth speakers to enjoy louder sound, the speaker module allows you to easily crank up the volume anytime anywhere. We should have a full review of these bad boys eventually but for now we are highly impressed at Moto Z and Z Force modular abilities over LG G5. Now, it is only available exclusively to Verizon (not our favorite carrier) but GSM versions should be coming shortly as unlocked phones. Next story Pokemon Go Hack Android – Go Simulator Bot! Previous story Honor 8 Unboxing! – Ultimate Pokemon Go/Instagram Phone?